If you visit Cyberguys.com and enter the keycode INFRARED today you can get this Infrared Thermometer for $30 (regularly $70). It measures in both Celsius and Fahrenheit with a temperature range of -4 to 608˚F. We can’t begin to tell you how handy these are to have around. We’ve used them for everything from checking grill temperator to determining how much water’s in a steel barrel. how do you use this item to check how much waters in a steel barrel? Because the outside air temperature hasn’t remained perfectly constant for the last week, the water inside is probably a different temperature. The top portion of the steel, with no water behind it, will track the air temperature pretty closely. The bottom, with the water acting as thermal mass, will not. There’ll be a fairly sharp dividing line where the top of the water is. Hold down the trigger, or put the tempgun in “lock” mode, and move it slowly up or down the side of the barrel. Where you see the temp jump, you’ve found the line. http://www.nationalinfrared.com/images/infrared_tank_level_detection.jpg shows the side of a tank viewed through an infrared thermal camera. Your infrared thermometer is a one-pixel camera. 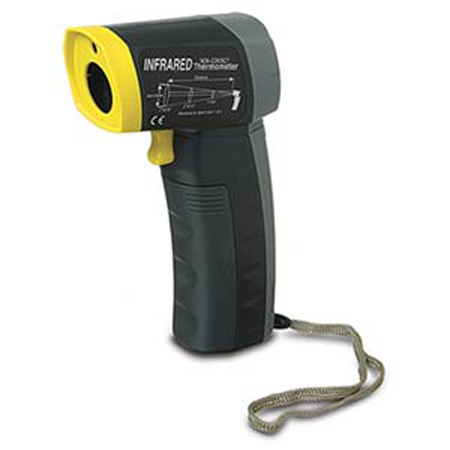 I should also point out that the Pro Exotics PE-1 (my personal favorite non-contact infrared thermometer) is regularly available for $25, and the Mini is up for $15 on a fairly regular basis. Both of these have a 1:1 distance-to-spot ratio, which means they won’t measure as narrow a spot as the $30 model here, but being keychain sized is awful nice. The Mini was posted here on January 29th 2007, and there was a longer infrared thermometer article on September 10, 2006. This is awesome. I’m buying it as we speak. Jeff: Nate hit it dead on — and the effect is even more pronounced when the water just came out of the hose (from the cold ground). Thanks for the tip. I just bought one to help me weatherize my house and to detect temperatures in the kiln. FYI: It is $40 not $30. These have always looked cool to me, but I haven’t had a good use to justify picking one up. I’m definitely getting one now just to check the smoker. HELP I have this and I cannot get the battery compartment open! There’s nothing in the instruction guide about it. I know this is silly. I cannot get the battery compartment open either, could you please help? Help! I’ve got one of those exactly like the one in the picture. I put new batteries in it and it’s flashing something like ‘AL’ on the screen. What do I do?